Publisher: Kemco. Developer: Gremlin Graphics. 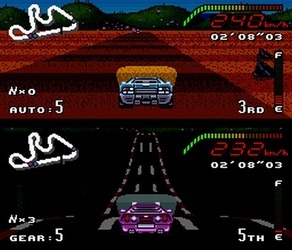 Before scrolling roads and circuits that rotated around vehicular sprites were inevitably cast aside in favour of wondrous three dimensional environments, Kemco’s Top Gear took an ageing racing blueprint, and extracted the absolute maximum from it. 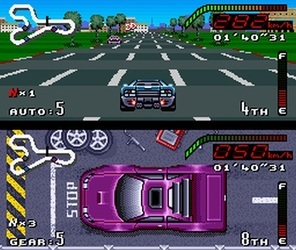 The end result is brilliant, and one of the best racers to grace the SNES. 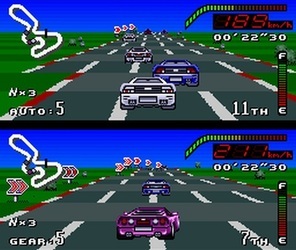 You compete in eight tournaments consisting of four races each and, starting at or near the back of the grid each time, you must negotiate a twenty-strong field of competitors, finishing in the top five in order to progress to the next race. 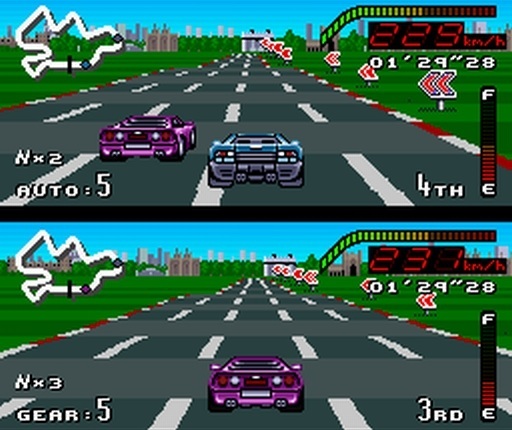 There’s no checkpoint-chasing or time limits involved here, though Top Gear has clearly taken inspiration from the best, mixing the blistering pace of Outrun with the technical finesse of Lotus Turbo Challenge (which uses the same graphics engine), making for a stunningly playable racer. Initially, Top Gear seems a little unorthodox, adopting a split-screen approach even in the one-player mode (the computer pilots the car in the bottom half of the screen), but though this sounds a hindrance on paper, it is a quirk that is soon turned to the game's advantage. The two-player setup is as a consequence every bit as quick and smooth as the single-player, and retaining eighteen A.I. competitors means the racing is consistently exciting and involved. From an aesthetic point of view, Top Gear comes off a surprising second best to sister-series Lotus Turbo Challenge. The tracks themselves are a little sparse-looking, and despite races being hosted in locations as diverse as South America, France and Japan, the horizon backdrops are, for the most part, pretty underwhelming despite appearances from the Leaning Tower of Pisa and Big Ben and the occasional nice (though somewhat indistinct) cityscape. 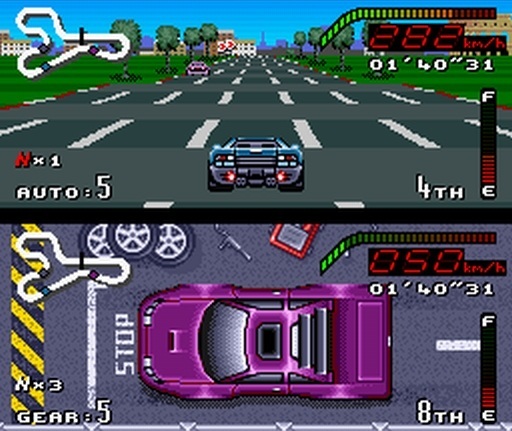 Roadside obstacles are similarly unimpressive, though the cars themselves are detailed and look the part. It may not look a million dollars on the surface, but it really goes some. 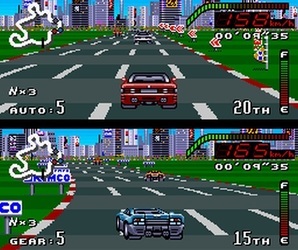 The sense of speed is sensational; environments lash past with unerring smoothness, and it’s all the more impressive considering everything is animated twice and with so many competitors too. 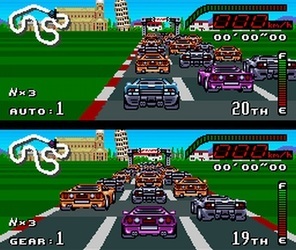 There’s little to stretch the SNES’s sound capabilities, with adequate engine whirs and the occasional tyre screech filling the sound effect quota, though the music does at least provide some energy, with its racy warbles blipping along at a near-frenzied pace at times. Still, it’s highly unlikely you’ll notice, let alone care. The handling is spot-on, both in terms of responsiveness and sensitivity, and the tracks prove the perfect compliment. 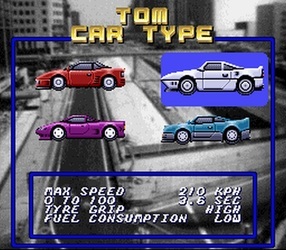 It has its share of vicious, high-speed S-bends to negotiate as well as sweeps and 90 degree corners, but brakes are rarely called upon as feathering the throttle is a perfectly serviceable substitute and made possible by the excellent feel of the cars. Top Gear recognises that the thrill of the racing lies in scything past competitors, and this is where the real skill to winning races lies. 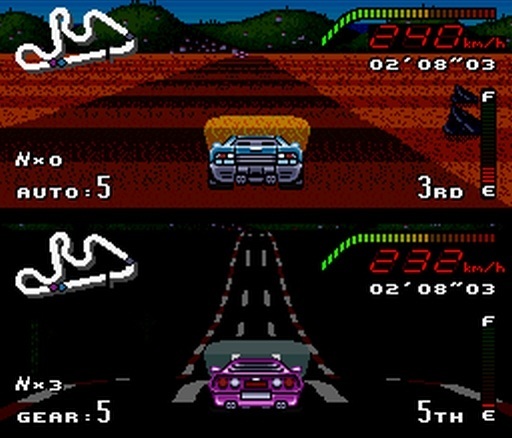 Adding to the challenge is the occasional off-road section that dampens the handling appropriately, whilst some craftily placed on-track hazards demand pin-point accuracy from the player in order to make it through certain sections of a course unscathed; these alter depending on the difficulty level you are playing on, which is a nice touch. As if tackling the competitive (and rather devious) A.I. wasn’t enough, Top Gear has some awesome pit-stops up its sleeve too. Short races don’t require refuelling, but the lengthier ones will see you diving in for a late splash ‘n’ dash. This makes for another intriguing variable, as positions can be won and lost on the judgement of how much fuel to take on; gambling on cutting it fine can be hugely rewarding if it pays off, but there’s also the risk of running out of fuel almost in sight of the finish, so it’s all about risk and reward. 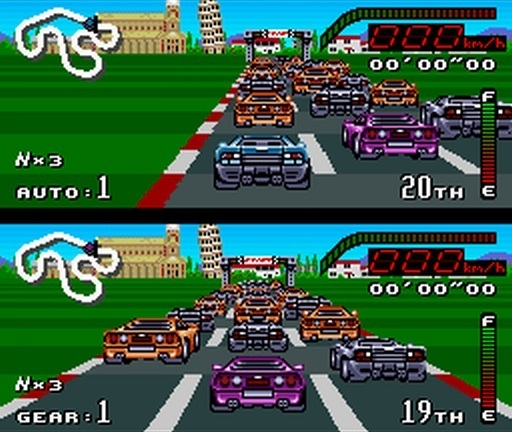 Nitro boosts can also be deployed at strategic moments (preferably not whilst you are in the middle of a complex set of corners) and really showcase the colossal speed of the game; there’s nothing like choosing your moment and darting past seven or eight competitors in half a lap. 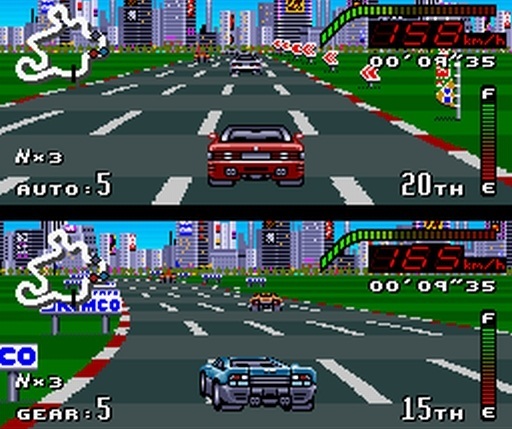 The single-player experience is great, but Top Gear really comes to life when you’re battling against a mate. 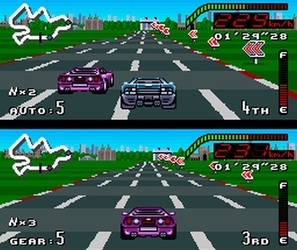 Each race is different, and as only one player needs to finish in the top five to ensure progression, it is also an ideal cooperative game, with one player able to bail the other out if they are having a bad race. The fact that there are points awarded down to tenth place ensures that every position gained may ultimately prove crucial in a championship bid, often leading to memorably close finishes. There four selectable cars offer considerably different levels of cornering competency and speed, though it’s the fuel consumption rate that is perhaps the most important attribute. Perhaps unintentionally however, it means the slowest, most economical vehicle is by far the most competitive, as it can save a lot of time not having to pit as much as the others. 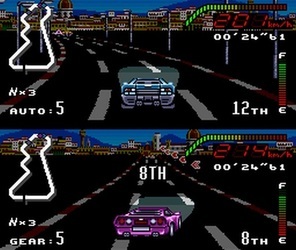 The fuel-guzzling speed demons cannot make up the time it takes to make a pit-stop in sheer performance alone, meaning three of the motors are rather more difficult to use effectively. 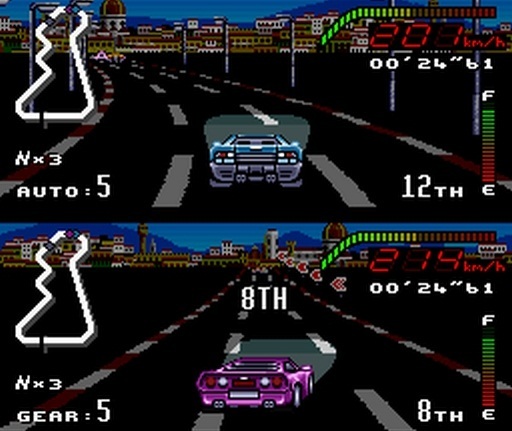 Scenic collisions are a touch limp and it’s slightly disappointing that there are no weather effects (though there’s the occasional night race), and a quick-fire arcade mode would have been the icing on the cake, but the majority of its troubles are of the ‘would’ve been nice if…’ variety and do little to tarnish the end product. Easy to get into but hard to put down, TG is a racer with plenty of mileage. There are 32 courses in all, with passwords awarded for the completion of every set of four races and once you’ve conquered them all, there are two additional skill levels that add further legs. The learning-curve is ideal; tougher tracks require a few goes to master and whilst it presents a decent challenge, progression rarely feels out of reach. Although no slouch on paper, Top Gear is so much more than the sum of its parts. A sublime marriage of speed, accessibility and depth make for an exciting and engaging racer that’s one of the best of its generation. "Although no slouch on paper, Top Gear is so much more than the sum of its parts. 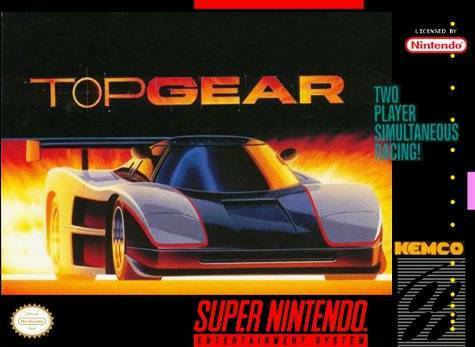 A sublime marriage of speed, accessibility and depth make for an exciting and engaging racer that’s one of the best of its generation"